Highways England has denied risking archaeological deposits at Stonehenge by using a mechanical digger to excavate archaeology evaluation trenches in wet conditions. Campaigners have accused the government-owned company of an ‘industrial approach’ to archaeology in its preparations for the A303 tunnel at Stonehenge. The consultation on the A303 scheme closed on 23 April. 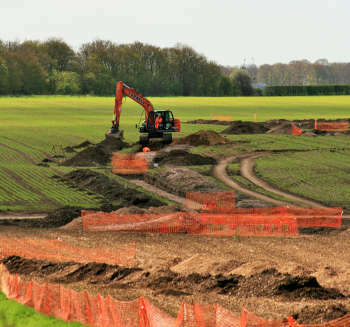 The Heritage Journal website said the use of heavy machinery by Highways England contractors in a field adjacent to Longbarrow Roundabout, just beyond the western boundary of the Stonehenge World Heritage Site (WHS), ‘underlines the threat that will soon reach the WHS’. It said the use of a mechanical digger, continually moving back and forth in the current wet soil conditions, ‘would likely devastate any fragile archaeological deposits’. The website said that if the investigations had been put off until the ground dried out, the risk of damage would reduce considerably, ‘but the timetable has been compressed by Highways England’s failure to engage constructively with landowners and farmers in the WHS, with no account of the farming calendar or extremely wet conditions exacerbated by periods of heavy snow’. David Bullock, Highways England project manager for the A303 Stonehenge scheme called the claims 'alarmist and untrue'. He said:'The archaeological investigations being undertaken are part of a programme of work devised in consultation with the Heritage Monitoring and Advisory Group (HMAG) comprising Historic England, Wiltshire Council Archaeology Service, the National Trust and English Heritage, taking expert advice from an independent Scientific Committee of eminent archaeologists. 'The archaeological evaluation works are being monitored on site by Wiltshire Council Archaeology Service and other members of HMAG. This monitoring has regard to both the agreed scope of works and the conditions on site. Separately a group of senior archaeologists have said that Highways England’s plans for a 1.9-mile long tunnel, both of whose portals will be within the WHS, would have ‘dreadful consequences for the world’s most famous archaeological site and its landscape setting’. The experts said they had all have carried out internationally recognised research within the Stonehenge WHS within the last 10 years or more. In a consultation response, they said the scheme would set a bad precedent by allowing large-scale destructive development within a WHS and that there was concern about impacts of any groundwater reduction on deposits associated with the prehistoric Blick Mead site.